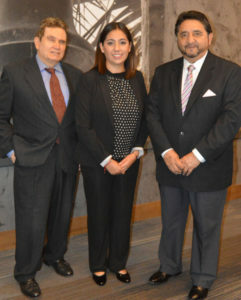 MEXICAN CONSUL, DAVE & BUSTER’S AND OCEANGATE HOTELS PRESENTED THE FIRST MEXICO SEMINAR FOR THE LUXURY MARKETING CLUB. 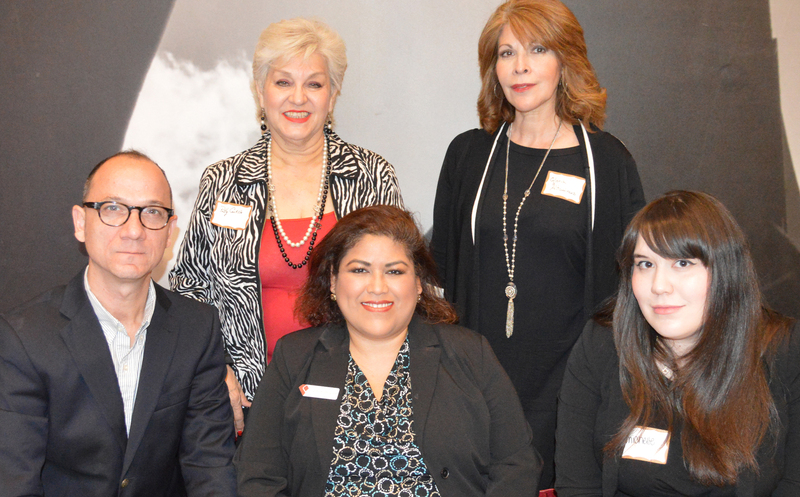 On Thursday, February 1st, the Luxury Marketing Club presented their first educational seminar with the Mexico and the RGV business themes at Dave and Buster’s with our new General Consul, Eduardo Bernal Martinez as the keynote speaker. The program started featuring the NAFTA topic and how important it is for the Valley to create more cohesiveness among our RGV cities. Consul Bernal Martinez also emphasized his desire to reach to those municipalities who have a sincere interest in doing business with Mexico. 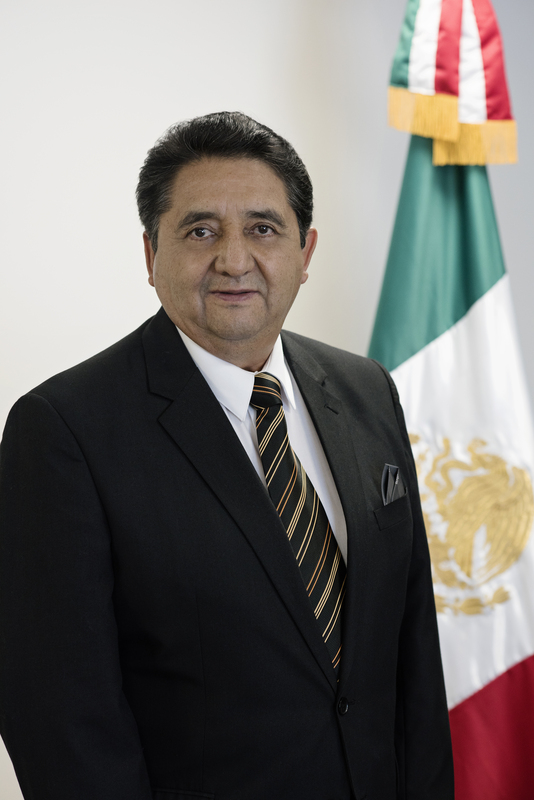 The United States would pay around $6 billion USD in taxes in Mexico. Could lose market against NAFTA competitors in Mexico such as Japan and Canada. It would affect economically the state of Texas as well as their labor mainly in the Rio Grande Valley due to the enormous amount of commercial transactions that take place on the border. It would reduce the economic resistance in energy matters in the face of oil price changes. Access to information in a more immediate way. The emergence of a new press that faces difficulties in being more vulnerable in terms of its veracity, rigor, and clarity in putting opportunity and scoop as values of digital transformation. The media saw an opportunity to offer content from a much more attractive and interactive visual perspective that requires opening new channels and serving new audiences. “Lic. Vargas who handles national and international accounts at Notimex brings a new conduit of communications resources and the best communications bridge between the Luxury Marketing Club, RGV, and Mexico” said, Olivia Garza, who is the office manager at the Luxury Marketing Club memberships program. 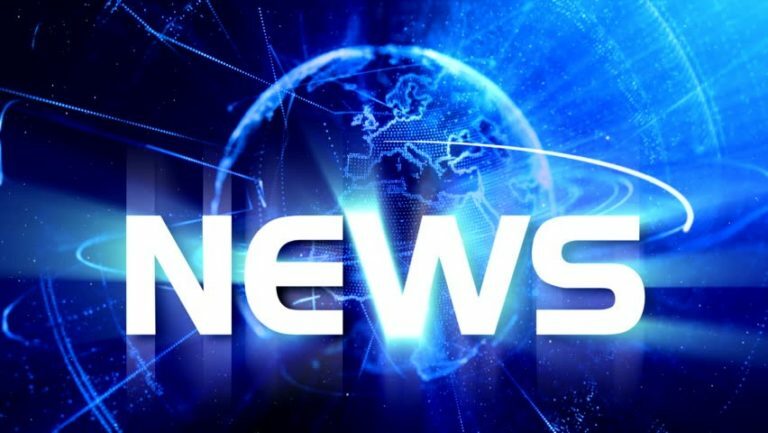 Notimex is the official Mexico News Bureau globally reaching over 2.0 million people daily. Mr. Joseph Romero de Velasco, Executive Director for the club emphasized his RGV report for marketing presenting his experience since he arrived in McAllen in the fall of 2015 from Dallas. One comment was that most ad agencies in the Valley provide “Prescription with no Dr. Consultation” to their clients; “Most creative is handled by the media due to deals and packages” diluting the power of advertising, “Spanish is handled too informally ignoring the difference between Educational to Persuasive” and the lack of integrated marketing with actual ad campaigns. “Is really a shame to see that big budgets are somehow wasted by throwing the darts in the dark by some in-house and ad agencies.” Said Mr. Romero who is a former madman at Campbell Mithun – Esty, Minneapolis and Creative Director at Romero Group International Advertising since 1993 in Dallas where he developed the Mexico markets for Neiman Marcus including the direct marketing campaign “Aventuras Romanticas”® for luxury travel and won the Ford Motor Credit account from Foot Cone & Belding in Puerto Rico and Mexico among others. The last speaker was Mr. Adrian Gonzalez partner with Romero Group who is handling the sales and marketing for the App Discover STx. 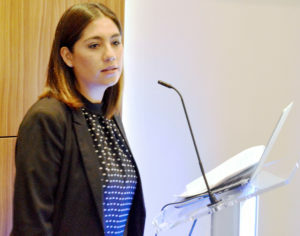 Adrian emphasized the need for his App in creating bridges between RGV cities and Mexico and that is becoming a catalyst for the club’s members in creating strong exposure in Mexico for the Mexican shopper and investors. Besides our prestigious speakers, some of our illustrious guests were our Consul’s wife Mrs. Roxana Bolnik de Bernal, Enrique Castro Septien, CEO and President, P. Merhen, S.A. de C.V., Lupita Rodriguez, Branch Manager, Falcon Bank, Daniella Plata, Press Office, Mexico Consulate, Silvia Castillo, Vice President, Social Life, Marcelo Rodriguez, Marketing Manager, Palenque Group, Laura Vega, General Manager, Hampton Inn, Mission, Adrian Reyes, General Manager, Comfort Inn, Plaza Mall and many other distinguished guests. 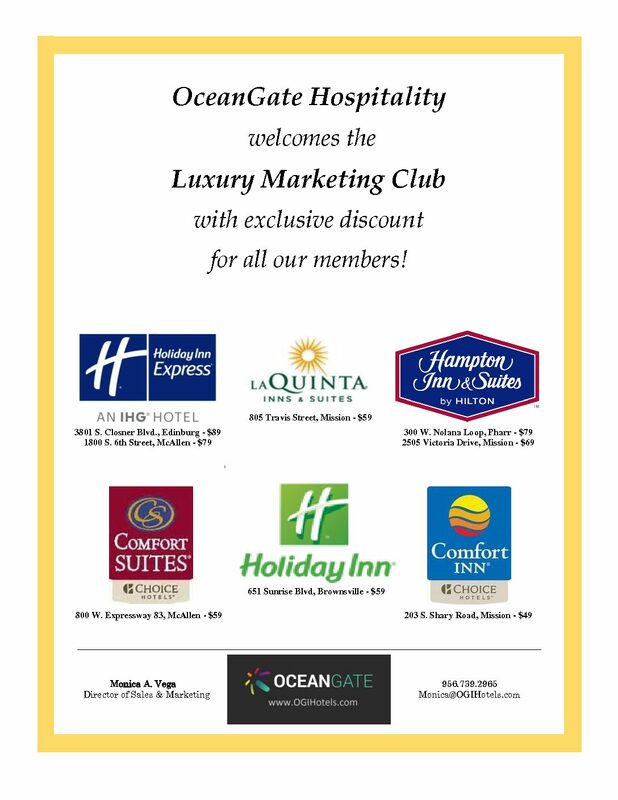 The Luxury Marketing Club was founded in McAllen late December 2017 with the first ad campaign for Dave & Buster’s and Ocean Gate Hotels this Winter in Mexico nationally with the famous McAllen “VIP Tour®” where Romero Group converted narrative editorial into exciting stories from shoppers who visit McAllen and the rest of the Valley landing at the Holiday Inn Express and enjoying a great time and food at Dave & Buster’s. For more information and photos please contact Danyelle at 956 683 4680 or 956 683 4681 you can also write to Mr. Romero at: jromero@luxurymarketingclub.com – www.luxurymarketingclub.com under construction available now for approved Business Editorial.